More than 100 students at the Academy of Notre Dame in Massachusetts have signed a petition protesting the killing of dogs in Call of Duty: World at War. Breanna Lucci, a 19-year-old student at the Academy of Notre Dame High School in Tygnsboro, Massachusetts, was watching her older brother play Call of Duty: World at War when she saw something in the game that disgusted her: he killed a dog. "My little 12-pound Pomeranian, Winnie the Pooh, is sitting next to him, and I'm thinking, 'This looks horrible!'" Lucci recalled. "My brother is a sweetheart. He won't be killing dogs after playing. But some people might." 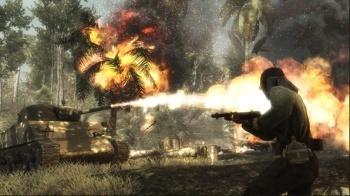 Lucci's fear that "some people might" be driven to kill dogs because of Call of Duty has led her to start a petition protesting what she sees as the despicable acts portrayed in the game. "Killing dogs as a form of entertainment ... over and over again...That's one of the objects of the game," she said. "Parents need to know what they are buying their kids. Killing animals should not be a form of entertainment." Lucci, who is the president of the school's animal rights club, pushed the petition throughout her school, and has gotten more than 100 classmates to sign their names. She hopes to eventually send it to Activision-Blizzard. Lucci has also won the support of school faculty, including the moderator of her club, Barbara Vitale, an English teacher who emphatically stated that "we don't think killing people is a good idea either." Neither do we. See, in all the indignant uproar, Lucci and her supporters are missing one important thing: context. Killing dogs is indeed one part of the "form of entertainment" that World at War delivers, but the game is far from a puppy murder sim. These animals are trying to kill you, so maybe killing them back isn't such a horrible thing to do. If we could hug all these rabid canines into submission, we would, but sometimes a rifle's all you got. Also, Winnie the Pooh is a bear. That's not a very good name for a dog.